For biomanufacturers, sterility assurance is a critical part of any process. To achieve this goal, sterilizing-grade filters have traditionally been used at multiple points in purification processes. However, as science and technology have advanced, so have the filtration options. Instead of the one-size-fits-all sterilizing-grade filter, you can now design a filtration train tailored to the specific needs of your application or unit operation. Selecting the right filter is the first step in reaping the benefits of today’s filters; optimizing their performance efficiency is key to maximizing the benefits for the lifetime of your process. Being able to depend on this performance efficiency means having confidence that your filters will always be able to reach a defined throughput or capacity in the set process time and, at the same time, provide the expected levels of microbial retention. Delivering this performance relies on your filter supplier having highly-controlled membrane manufacturing processes. Ideally, the filter supplier will also have a sound understanding of the fundamental mechanisms of filtration to provide guidance on both filter selection and how to maximize filter performance under your process conditions. Optimizing the performance of sterilizing filters in a process is often shaped by the facility fit, which might constrain the operating conditions. For example, existing equipment may limit the process to either constant flow or constant pressure operations; in these cases, filtration processes can be designed and optimized to accommodate these limitations. Similarly, the scale of production or facility setup will determine whether cartridge filters must be used in stainless-steel housings or whether the process can accommodate a more flexible single-use system. These types of decisions influence multiple aspects of process design and optimization. Permeability is flux per unit pressure and determines how quickly and efficiently a filter can process a fluid stream. Changes in permeability impact the duration of the filtration step. For non-plugging fluid streams, such as buffers, specialized filters with high permeability can quickly process a large volume of fluid with a small amount of membrane area. For plugging fluid streams, such as cell culture media, high permeability filters are less useful, as the membrane plugs quickly. Filtration of these streams often relies on membranes that have lower permeability, but a higher capacity for particulates. Throughput capacity determines how much fluid can be processed before the filter is plugged to the point where it is no longer useful. The symmetry and morphology of the membrane in the filter greatly impact the throughput capacity. Symmetric membranes have pores of uniform size throughout the depth of the membrane, and while they may provide excellent microorganism retention and reasonable throughput for non-plugging streams, when challenged with a more fouling fluid stream, the microorganism-retentive pores may foul prematurely with particulates. Asymmetric membranes have a gradation of pore sizes through the depth of the membrane, enabling the larger pores at the upstream side of the membrane to trap and retain particulates while allowing the smaller microorganism-retentive pores deeper in the membrane to remain open for fluid passage. 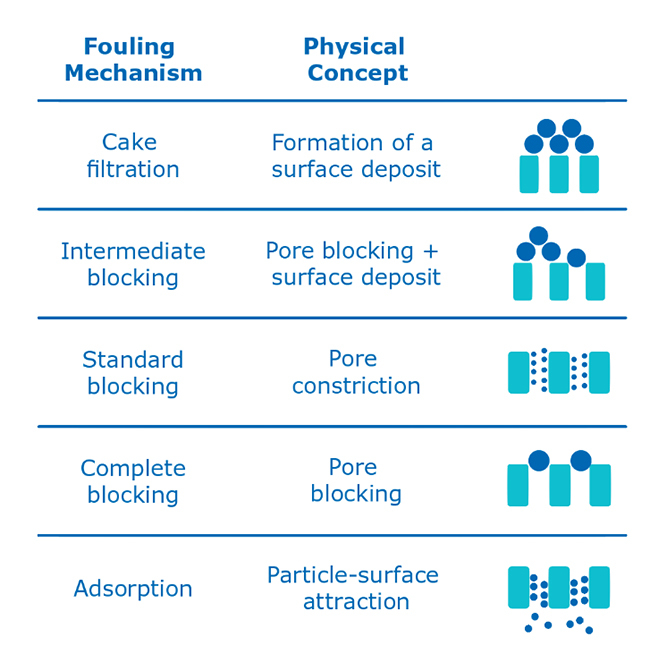 The gradation of pore size is the reason asymmetric membranes generally allow higher throughput capacity with fouling streams than symmetric membranes. Prefilters can significantly improve the overall performance of a filtration train by removing unwanted particles before the fluid stream reaches the sterilizing-grade filter. By reducing the particle load prior to the sterile filtration step, manufacturers can reduce the amount of sterilizing-grade membrane required. As prefilters are less expensive than sterilizing-grade filters, implementing prefiltration can result in significant cost savings. However, designing a filter train that includes prefilters can be complicated, as you must determine the optimal prefilter-to-sterilizing-filter-area ratio for maximum efficiency. Oversizing the filtration area means the filter train is more expensive than it needs to be, and undersizing risks incomplete batch processing in the expected time. While a prefilter affects the performance of the sterilizing filter, the sterilizing filter can also affect the performance of the prefilter by restricting fluid flow through the prefilter. This complexity is increased when thinking about the different sizes of particulates in fluid streams and how these impact membrane pore fouling (Figure 2). 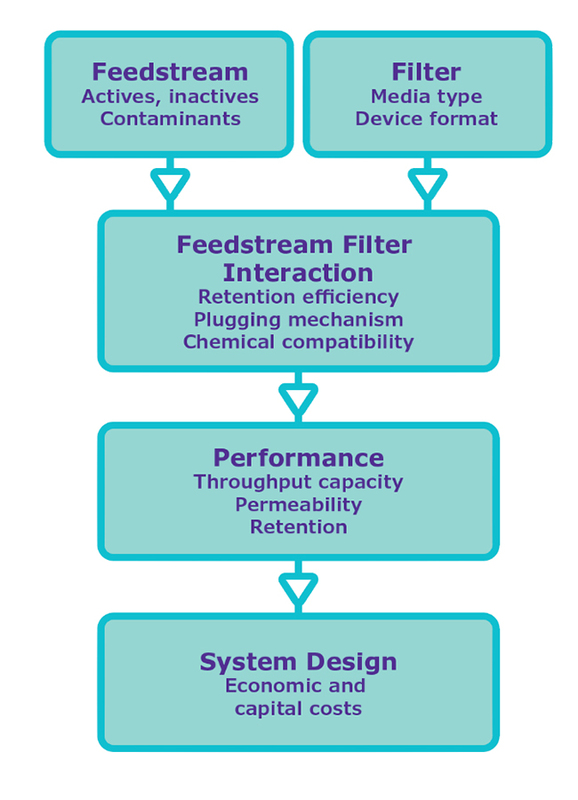 Descriptions of filtration mechanisms and the factors that affect flux and throughput capacity have been published.2,3,4 Technical experts at MilliporeSigma used this information to develop proprietary modelling software that can be used to predict filter performance. Filters are run under constant pressure, recording the volume processed as a function of time, and the data generated is used to predict filter volumetric loading capacities using the modeling software. These models can also be used to predict loading capacities using data generated from trials run under constant flow conditions. 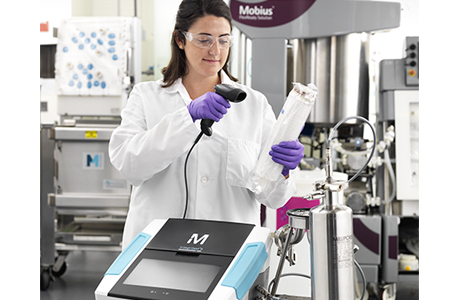 The modeling software determines which filtration mechanism or mechanisms best describe the observed filtration behavior, resulting in more accurate and reliable filter sizing. Characterizing and predicting performance from filtration trains that include prefilters and sterilizing-grade filters adds additional complexity. Yet, with some modifications in trial setup, the modeling software can be used to predict the optimum number of prefilters needed upstream of a sterilizing filter to process a fluid stream within the target time and the batch volume. In general, additional prefilter area results in increased throughput capacity. 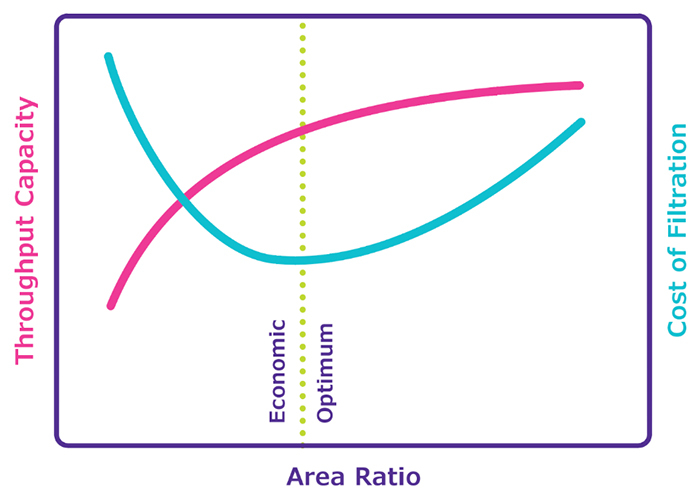 Depending on some considerations, such as the respective costs of the prefilter and sterilizing-grade filter, there can be limited benefit in additional prefilter area (see Figure 3). The MilliporeSigma predictive models can incorporate pricing information to identify the most cost-effective solution for the process conditions. MilliporeSigma offers technical support in streamlining trial design to minimize the amount of effort and volume of fluid needed for trials. These technical experts can also help process trial results into an optimized filtration train design to minimize cost, footprint, or some combination of these, to maximize filtration efficiency. Most importantly, this approach to predicting filtration performance has been empirically verified using different filters and feed streams. The main purpose of these small-scale trials is prediction of process scale performance, which relies on good scaling in filtration performance between small and process scale devices. Reliable filter manufacturers will have data for their filters in one or more process streams demonstrating good scalability. 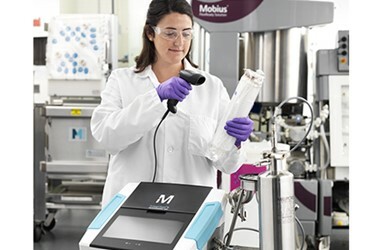 Although filter selection and an optimized filter train are essential to maximizing the efficiency of throughput capacity performance, the most important aspect of any sterile filtration operation is making sure the filter is integral. Integrity testing assures the filter has performed as expected and prevented passage of bacteria. There are two types of integrity tests to assure filter performance. A pre-use integrity test confirms the filter is correctly installed and there was no damage from shipping or installation. The pre-use test is widely recommended, though required only in certain geographies. End users who distribute their drugs globally should keep this in mind when deciding on a testing strategy. Post-use integrity testing is performed after processing to ensure the filter was not damaged during use. This is a regulatory requirement in the United States and most other geographies. Integrity testing specifications are filter-specific and should correlate to bacterial retention performance. Each filter product, and sometimes different formats of the same product, will have different integrity test values. In general, for small-area filters, a bubble point test is recommended; for higher-area filters, diffusion testing is preferred. Because sterilizing-grade filters have different wetting guidelines, it is important that the correct conditions for the specific filter are followed, as the bubble point and the diffusion tests rely on a fully wet filter membrane. To confidently assure filter performance, check the test guidance from your filter manufacturer. Regardless of your filtration goals, new filter technologies offer improvements in operation, efficiency, and cost. However, filter selection and optimization can be complex, especially in the early stages of process design where multiple filters may need to be selected. Partnering with a supplier that has experience and deep understanding of membrane and filter design can help streamline the design and sizing of a filtration system that delivers the performance and safety assurance needed for producing biopharmaceuticals for patients. Kimberly Steffen is a Technology Manager at MilliporeSigma supporting the biopharmaceutical industry in aseptic processing. In her current role, she helps preclinical and commercial therapeutic manufacturers implement bioburden and sterile filtration technologies across the manufacturing process from upstream to drug product final fill. Kimberly has over 10 years of experience in the life science and pharmaceutical industry. With a background in pharmacology, she received her BS in Pharmaceutical Sciences from The Ohio State University. Sal Giglia is a Filtration Applications R&D manager at MilliporeSigma and has 30 years of experience in the area of membrane based separations. He is listed as an inventor in more than 25 patents related to membrane separation devices and processes, and has authored a number of publications covering various aspects of membrane filtration technology, including process modeling, sterile filtration, virus filtration, integrity testing and scalability. He received his BS in chemical engineering from Tufts University and MS in chemical engineering from the University of Massachusetts.